If you haven’t done it yourself, you know someone who’s spent a fortune on home workout equipment. 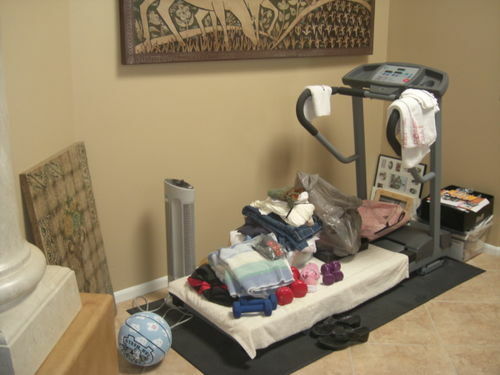 In most cases, you also know that their stationary bike seat has seen more laundry than glutes, and their treadmill moonlights as another “couch” when they have guests over. Embarrassing? Yes. Wasteful? Yes. Typical? YES, unfortunately. Just take a look on Craig’s List at all the barely used equipment for dirt cheap prices. Consider each one a failed New Year’s Resolution. At least it's being used for something... I guess. When it comes to working out at home, I say don’t make it a habit UNLESS you have A) a personal trainer holding you accountable, or B) a friend/training partner who can help keep you motivated. Even those with the best intentions will eventually bore of training on their own at home. Without a motivating environment or others around to keep you honest, it’s really tough to stay fully inspired for your workouts. Now, having said this, for those of you who want some home equipment for those rare days when you just don’t feel like driving in to the gym again, or for a quick and dirty workout here and there, I’ve listed a few great pieces to invest in (see below). Part of the beauty and efficiency of training with compound movements, using your bodyweight as resistance, and just being inventive and smart with your workouts is that you will spend less time AND money on training. If you absolutely insist on getting workout equipment for your home, go with these space- and money-saving staples. Invest in a pull up bar you can simply hang in a doorway. It’s mobile so you can switch rooms if you need to and if you can get one with varying hand grip positions, even better. The pull up is such a staple compound movement for building strength and muscular endurance (see Kipping Pull Up if you don’t believe me about endurance!) that this piece of equipment won’t go to waste. My fiance and I got one and we keep it upstairs in the spare room. There’s nothing like knocking off a few pull ups here and there to amp up energy and feel strong, any time of the day. This diverse training tool can be used in so many ways. From your regular kettlebell swing to weighted squats to single-arm snatches, and so on. Originating in Russia and originally known as Girya training, kettlebell training just SEEMS like a fad right now in North America because it’s become increasingly popular over the past few years. In reality, it’s been around since the 18th century. A couple kettlebells of varying weights are a great idea for quick at-home workouts; they’re well worth the investment (aka, are CHEAP and you’ll use them) and take up almost NO space in your home. Surprised? Why? A treadmill or bike isn’t the only way to warm up for a workout or get your cardio in. Plus, a skipping rope takes up so much LESS space! There’s a reason the world’s fittest MMA fighters use skipping ropes for training… Skipping is an incredible cardio workout. And, once you master double unders (or even TRIPLE unders – not that I’m there yet! ), your workouts will get even better. Warm up by skipping and then add timed skipping in between rounds/sets of your workouts to keep your heart rate up and improve cardiovascular fitness. There ya go – 3 must-haves for training at home. They’re cheap, take up almost NO space in your home, and can be easily stored away when company comes over. The best thing about them? You’ll use them! This entry was posted on Tuesday, October 25th, 2011 at 5:00 pm	and tagged with affordable workout equipment, cheap workout equipment, exercise at home, Fitness, Health, home workout, Kettlebell, Physical exercise, Pull-up (exercise), Shopping, Skipping rope, Sports, training at home, work out, work out at home, working out, workout equipment and posted in Uncategorized. You can follow any responses to this entry through the RSS 2.0 feed. What a great post. I MUST work out at home, since I live 20+ miles from the nearest facility, which is tiny. I have none of those items… Thanks for posting. Thanks so much for the positive feedback! Wow, you really DO have to work out at home. 🙂 Glad I could help. PS – I love your site! You’re a fantastic writer. That is a serious distance from the gym. In the simmer months you can always take your training to the park. I used to do it in London, making avail of the park benches, step areas and trees (maintenance guys weren’t too keen on the swinging from branches though). lol, well, I am surrounded by riverhills and dirt roads, and one neighbor who walks those paths with me three + days a week. But I do need something for the winter months, and these suggestions will come in handy! I’ve been trying to get on a routine to use my stationary bike at home, but you’re right, it is hard. Especially when it’s right next to a very inviting couch. My best exercising tool is the dog. He needs to get outside and I need the exercise. But the jump rope sounds like a nice change of pace. Congrats on being freshly pressed. This is a pretty fabulous post. I must confess – guilty as charged. I bought an elliptical last year (it was on sale). After a couple of failed gym memberships in which I was spending way to much money to pay for a place I never had time to go to… I thought this would be the smarter option. I will admit, the machine sits in my laundry room and I hardly ever bother to use it. I always use time as an excuse, but lord knows I could at least spare FIFTEEN MINUTES a day, just to be able to say I didn’t waste my money (or laundry room space) on the thing! Great post! My favorite motivator for home workouts is Bodyrock.tv with Zuzana because her workouts are really challenging and there’s a lot of variety. I also find 3-6 pound dumbbells to be useful home workout tools :-). Kettlebells rock – need to go get one at Sports Basement. And the jump rope is an awesome idea! I totally agree – Bodyrock is AWESOME. Zuzana is so fit and motivating… And very creative! She always has great ideas. When I had the room, I worked out with equipment every day. I loved it. I didn’t have to go out and buck traffic etc. Thanks for your post. I work out at home in my basement. I have a treadmill. I also do aerobics with DVDs and yoga. I have a yoga mat. I also dance. I was going to invest in some light weights but I will check out kettlebells. Can you jumprope on carpet? Hi Karyl! Good for you for staying motivated to train at home… My couch just starts to look so comfy once I get home. 🙂 I have definitely skipped on carpet. We have berber though, so it’s not exactly the groovy 70’s shag kind. That might be tougher. 🙂 Actually, come to think of it, it ‘s probably nicer on your feet to skip on carpet as opposed to cement or pavement. You might be on to something! Great post! Congrats on being Freshly Pressed, as well! You have just saved me hundreds of dollars as I was seriously considering either an elliptical machine or treadmill (to use as a towel & coat rack – LOL). hi, nice site – couldn’t resist writing about working out at home. After several failed attempts to motivate myself to go to a gym (takes too much time going back and forth!) I resigned myself to the fact that the best way for me to workout is at home. it helps of course that I have a workout partner (my wife, Jan) who loves to workout too. Best equipment at home (for me). Aerobics; Bicycle (outdoors); my favorite aerobics. I live in the blue ridge mountains, so the streets here are VERY hilly; great for interval training – go down the hill with the brakes on so youre not just coasting, then go up the hill huffing and puffing for an intense interval workout. Do this 8 to 12 times in 30 minutes for a super workout. I love jump roping but can’t do it any more. I’m 59 and even with a good warm up on a good surface its just too much for my knees. Strength training: I love pull ups, so I totally agree about the bar. I have one with different grips, and agree. Dumbbells and bands – the bands are necessary for things like lateral pulldowns; make sure you have a strong door and a good attachment for the band to hook it into the door. Jan and I are working with a physical trainer we love (Samantha Pollack) and feel that we now have a really well rounded routine. A netflix subscription is a must, as well as a rule that you never (well, not too often) sit when watching TV. One more thing about routine – if you live a busy life (as you all do, no doubt) if you can arrange to get the best part of your workout first thing in teh morning, you’re least likely to let it go. Well, that’s what works for us. The other 2 rules, if you like rules – you have to find something you enjoy. The other rule is really the same – a good workout is one that you do. In other words (this is getting confusing, sorry:>) if you don’t like it, you won’t do it. Doesn’t matter what equipment you have. And if none of this is appealing, join a walking club, go out dancing, climb mountains, fidget in your chair all day (really, there’s a doctor who wrote a successful book claiming he’s helped thousdands of people lose weight by fidgeting). Well, there’s a simpler one for exercise: “move more”. Don, thank you so much for that amazing feedback and some really great ideas! Thanks again. And, btw, how great is it that you have Jan to keep you motivated (and vice versa)? We should all be so lucky! Great info…I hope this helps to motivate the home workout movement. First I started with using my own bodyweight…already owned one – it’s there whenever I need it. Once I built up the strength to lift myself, the pull up bar got installed, (it just hangs over the door frame, and can be taken down when guests need to use the powder room) followed by the kettlebell and jump rope! It really works. Then after a being consistent for a year I felt I earned the right to buy myself a sandbag…I love my sandbag. AND oh, the Dip Stand, but you’ve really got to earn that one. As we age, it’s not the dumbells we will have to pick up, it’s ourselves. Thanks for the feedback! Love your outlook on training at home… I have to agree about bodyweight workouts. Still my tried-and-true favourites! This is a great article. My father has exercise equipment that takes up a lot of the space in the rec room in the basement. What I did was find a TV series that i wanted to watch (bought all the seasons on dvd), and disciplined myself to never watch the show unless i was on the treadmill … that was the ONLY way that the treadmill was used. Oh this is well timed… I am so un-motivated at the moment, but seriously can’t afford the gym!! Need to get some equipment! Great advice! You can also do those DVD workout routines, but I agree; working out at home is a weak alternative to a gym or personal trainer. I will subscribe to your blog. Have a great day! I got all three of those in my home now. I spent four years in the Marines watching a lot of guys spend more time chatting in the gym than working out, so I much prefer to do at home work outs (this could also because I got sick of guys staring at me at the gym). I really have enjoyed doing Insanity and Asylum over the past year and feel confident I’m getting a full body workout as long as I stick to the schedule. I definitely agree about equipment becoming furniture, which is why I like the dvd series that require a pull up bar and resistance bands and that’s it (I also live in a very tiny apartment). Dvd series can be a good alternatives to the gym if you can’t afford it or don’t have access to one. That being said, I’m very OCD and can’t start my day until I’ve worked out first thing in the morning so discipline and motivation is definitely not a problem. Love your site, it’s so great to see other women who aren’t afraid to push themselves to their limits and see how truly strong they are. I look forward to reading more of your posts. I personally LOVE working out at home. I’ve gotten past the point where I don’t feel stupid doing DVDs like Insanity or various Kettlebell workouts. But yeah, I agree, if you can keep yourself motivated then I definitely think home workouts are a good option, but that’s hard to do. Great post! I used to go to a gym, but when I figured out the amount of time I spent getting from home to the gym and back I realized how much time I was wasting. So it’s home workouts for me now! Health is Wealth. Keep yourself wealthy by keeping your Health. Great article, and couldn’t agree more with the 3 suggestions. Being a full-time college student and a full-time worker I have a very limited time slot where I am able to actually workout. This causes me to generally be forced into my dorm room for body circuits. However, this article has shed some light on what other options are out there for someone in a situation similar to mine. Great post!!! Several years ago I worked as a wakeboard instructor, and a fellow instructor put together a jump rope work out for us to do after the kids went to sleep. We all laughed at her…until we got there! It’s one of the most under rated workout tool out there! A jump rope would be at the top of my list. I had an exercise ball, which was also good to sit on, but I had to deflate it because the kids were rolling around on it like it was a theme park ride and it became way too dangerous! Time to get some kettlebells. This is just what I was looking for tonight. Thanks. Simple, yet effective. Small, yet dynamic. Inexpensive, yet invaluable. I wish I could jump rope but I find it too hard on my knees (and I am only 35 😦 ). I’ve found that the best thing for me is the Nike Training Club app that I have downloaded on the iPad. They have some great workouts that I can do without any equipment whatsoever. It’s perfect for rainy days when I can’t go running or swimming. What a great, concise & on-target list. As a shameless lover of ab work-outs, Pilates & Yoga I would also suggest including a Yoga mat. It gets you into your “space” & provides a secure surface for working out. I totally agree. However I did purchase one piece of equipment which I do use each day. Its meant to work my abs … will keep you posted on that one. The best equipment I would suggest is a good pair of running or jogging shoes … they don’t cost much, you can just head out the door when you’re ready and don’t have to drive to a gym. A local swimming pool is great, but they do cost to use, and if you don’t live close, you have to get the car out of the garage. The other thing I owned but sold a few years ago, and now regret selling is a small round rebounder. I used it a lot on the rainy days, but it went west in one of our many shifts. I wish I had never sold it. All the best everyone, and YES, a skipping rope is just the ticket. Well for winter I don’t have extra equipment. I should get back into my simple yoga and pilates. Otherwise my go-to “equipment” is my bike. I’m car-free so I cycle whenever I can to work, shopping, fitness and on vacation, we pack up our clothing in our panniers and go cycle-touring. Fresh air and once bike is bought, some cycling stuff, one is good to go. I returned to cycling in 1992 and haven’t stopped since. Will turn 53 next yr. I hope this gets folks thinking about any exercise on a regular basis. The quality of your life, does depend on it..long term. Love the punching bag idea… Such a great workout. I would say a pair of running shoes, push-up hand rests, dumbbells, a cycling machine and a yoga mat. The first four go under the cot or above the cupboard and the last stays close to a wall. Gives me the feeling of having a gym at home that I can use any time and they hardly occupy any place. These things differ a little from one to another I guess. Thanks for an interesting post. Wait what about #4, The Bowflex?? I hear having The Bowflex is like having 10 gyms in one! And it looks dominating and impressing for when guests come over, so that they can ponder how Fit you must be for using The Bowflex. Also, it comes in really handy for hanging wet towels on when you never use it. Hilarious! You’re right – the Bowflex is the most expensive towel rack out there…. With all the exercise equipment at my home.. this post hit home.. thanks! Great blog…I was actually looking up treadmills/ cross trainers the other day as I love to run but the winter months are coming in fast and steady. Big fan of the pull-up bar, although I’ve smacked my head off it one time too many when walking in and out of the spare room. Treadmill 5: Me 0 | Whats4dinner? very good! big shocker about the jump rope – good tip! I was going to ask you if the shake weight or the pull-up bar was better. I want to get one for hubby for Christmas. Don’t they pretty much work the same muscles! Congrats on being FP! Thanks again! Thanks for taking the time to comment and for the positive feedback! IMO, always, always go pull-up bar over shakeweight. 🙂 Shakeweight is a gimmick that won’t be around in 10 years. Pull ups are timeless. Great ideas. If anyone doubts the effectiveness of a skipping rope try it for three minutes, then try to tell yourself your not feeling it. I don’t go to the gym because I don’t need to. You can do push ups, abs, squats, lunges and various bodyweight exercises that will give you BETTER results. The key is in consistency. Jump ropes are a good idea! Goood call! I need to get one – cheap and effective. Cool article. I know you are talking about cheap gym equipment but people can also benefit from doing ‘dips’. This is an exercise that requires just any piece of strong straight wood or furniture above knee level. The dip works the tricep really well. So, it complements the pull up bar which works the biceps, and lats. Furthermore, push ups is also a great way of working the arms and chest. Try this push up version – time yourself and see how many proper push ups you can do in 3 minutes. It gives you a good pump. I like how you valued space. That’s a very big matter when you decide which equipment will make it. I never heard of kettle bells before but it seems easier on the palms then dumbbells. Jumping rope is a lot harder than it looks: definitely not just for little girls in parks. “Consider each one a failed New Year’s Resolution.”–hah, brilliant! And oh so tragically true. Nice post. Thanks for the information. Already have jump ropes, going to add the kettlebells and try the pull up bar. I recently moved away from my hometown which offered many kettlebell classes. I bought my own kettlebells to have at home and love them! Kettlbells are a great way to work out every muscle in your body and get some cardio in. I am so happy that people are finally catching on to this amazing workout tool. I completely agree and never work out at home. I need someone holding me accountable even if it’s just the other weary jiggers on the treadmills surrounding mine at the gym. My house is my sanctuary, I don’t want the kind of guilt the cluttered treadmill brings as it stares me down from the corner of my bedroom. Great article here. It is always nice to read posts that are about working from home. Keep up the good info. Thanks for the ideas, need to google ‘double unders and triple unders’ now! I have been able to get into the best shape of my life at home, without a gym, using only two sets of hand weights (5s and 10s) and a yoga mat. I am an exercise junkie! Always looking for new and fun ways to burn some calories…but my biggest passion as of late is yoga. It is the best workout I’ve ever encountered, leaving me with a ripped core, toned arms and much better posture. I prefer working out at the gym to struggling to keeping fit at home. I lack the initative whislt I am surrounded by such a familiar environment, as well as the motivation which pushes me to go further at the gym. I’ve cut out the cost of gym memberships and have been working out from home for nearly 3 years now! For me, having the right DVDs and equipment helps me to stay both in shape and motivated about staying in shape. I combine outdoor running (while the weather allows) with yoga DVDs or weight training. I love the 10 minute workouts–I have no excuse not to fit them in. Over the years I have tried treadmills stationary bikes weights and many other contraptions i even had a bullworker, but as you said i get too bored after a very short period of time, but i find that going to the gym is not any better. i get sick of going after a month or two. now i work out 3 hrs a week doing a form of Jujitsu. not only is it fun but working out and sparing with the same people twice a week does creat a team like feeling adn we motivate each other to come and if you skip a class everyone will be calling you to see whats up. now i actually have a punching bag in the corner of my living room and i find myself working out with it often. its a really great workout. just 10 to 15 min of hard hitting and kicking of the bag gets the blood pumping and the sweat pouring off my head its also enough time to get the muscles in my arms legs and chest burning. What about something for the senior citizens though? A skipping rope is such common sense, yet I never would have thought of it. Thanks for this gentle reminder! i would go as far to say that it could be worth putting in a fourth point, willpower! Having all the kit and equipment in the world will make no difference to a person unless they have the drive and determination to get up and start training and let the roller ball effect take over. Good post like what you have done! Great article and I totally agree with taking advantage of working out at home. I train in both traditional Kung-fu and tai chi and whenever I’m not at the school training, I’m working out at home. I don’t need that much space and I can do almost everything that I could do in an open field or spacious gym. The other added bonus is that I have access to a rather large backyard to wield around the martial art weapons I have. I agree with your the three pieces of equipment, but would add another inexpensive small piece that has wonderful benefits. The ab wheel is less than $10 and provides amazing results. There are better ways to strengthen your core, but for at home and on the cheap, the wheel is tough to beat. Follow via Email for FREE Workouts and More! Enter your email address to have new blog posts delivered directly to your inbox! Founder of H.I.T. Club Fitness - High Intensity Training for Every Body. I'm a Certified Personal Trainer and Fitness Copywriter who is passionate about fitness and health. I love helping others discover their inner athlete while getting in amazing shape with High Intensity Training. Most importantly, I live what I teach and love what I do every day!